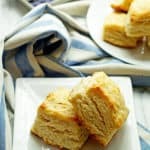 Classic, delicious and flaky all-butter biscuits ready to start your morning (or dinner) off right. Preheat oven to 450 degrees. Whisk together flour, salt, and sugar in a medium sized bowl and set aside. Using a cheese shredded, grate butter into the bowl of dry ingredients. Pour in buttermilk and combine. Roll out dough then fold over itself. Repeat rolling out dough then folding two more times. Finally roll out dough and either cut into biscuit sized pieces or use a round cookie cutter or back of a can to make round biscuits. Add biscuits to a slightly oiled pan and bake 12-14 minutes then serve. (These don't brown very much so if you want them browner, you can turn on the broiler for a few seconds but don't overbake them or they will lose their tender quality and get a bit harder).